As a film editor, one of my duties is to study each shot and look for mistakes (boom mics within the frame, position of props, etc.). And because of that, I often notice what the extras are doing to make sure none of them are ruining the take (like looking at the camera). Every so often, I find myself watching extras when I become bored of a movie or show I'm watching. It's become a bit of a fun game. So much so, that I've become quite fond of background actors. It's a skill that sadly goes uncredited. After all, by surrounding the main actors with these "extras" they help make a scene and location feel believable. They play an extremely important role. Can you imagine a film like Saving Private Ryan without all those soldiers running alongside Tom Hanks? They may not be given actual screen credits, but the film industry is aware of their importance. In fact, in 2005, comedy genius Ricky Gervais created his TV series, "Extras" where he played a background actor. Each episode showcased his character's struggle to upgrade his uncredited work into a speaking role. I was happy to make the cut, and more so with my experience, which sparked an intrigue into this world. Why would someone want to be a background actor? Is it just a hobby for those involved? Do any of these participants yearn to act beyond the background? I recently had a chance to talk to Jesse Heiman, a young man who not only has been featured in the background of over sixty film and television projects, but has also become arguably the most famous extra. It's not apparent how his fame began, but over the years people now refer to Jesse as a kind of "Where's Waldo". Celebrities request him by name to appear in their films. Since first starring in American Pie 2, Jesse has appeared in such high-profile projects as: Old School, Catch Me If You Can, The Social Network, Transformers: Dark of Moon, as well as on TV ads. He was even invited as a guest on The Tonight Show. A few years ago, someone compiled some of his more famous appearances and posted it on YouTube. Since its posting (on March 14, 2011), the video has reached nearly three million views. And along with these appearances, Jesse has been the topic of several interviews, one from EnterBRAINment which can be viewed here: www.enterbrainme.com. It's safe to say that Jesse has single-handedly brought background actors to the foreground. Jesse as a guest on "The Tonight Show"
I learned of Jesse Heiman a couple years ago, but my curiosity finally peaked after viewing him in a recent commercial for Prego. I had to know more about this gentleman. Much to our delight, Jesse was happy to accommodate 2nd First Look with an interview about his fame, acting career, and even information on how to become an extra. First, thanks for wanting to interview me about my extra work and career. Some of my favorite projects have been the ones you and everyone loves finding me in like: Old School, Spiderman, The Social Network, "Chuck," "Glee," Van Wilder and The Jerk Theory, where I wasn't an extra but part of the main cast. "Chuck" and Old School are at the top of my list because I worked on both for the long run of their productions and got to know the other actors and the crew and filmmakers. "Chuck" was five years of feeling like part of the family, and those are the best kinds of sets to be a part of. What is the process for extras to get work? The process to get work as an extra is really simple. If you want to be an extra, just go into a local casting office and ask to sign up to be an extra. There are offices in every major city where productions are made. They are always eager to hire local people who want to be extras in their films and TV productions. Then when you are signed up, they will call you for work at any given time they need your look for a part. Be ready to jot down the location and wardrobe information and what time and date you need to be there. When the day arrives, try to get there early and be professional; this is a job, not a vacation or school. This is hard work; you may be on your feet for nine to twelve hours a day. It takes a lot of patience to do this job. This is not a job to take if you need to be somewhere else on the day they need you on set. When they need you, show up and do what you're told, or you may be sent home and/or not asked back. For me and others in Los Angeles, there are services that call around to the various extra casting companies for us and then call us when we are booked. Is there a community of extras that often work together? Yes, there's a large community of extras that end up working together often. Think about it: if you need to fill a hospital scene with people that look like doctors and nurses and medical staff, you're gonna hire extras that look that way, and there's a good chance if you play doctors all the time you'll end up working with the same folks. For me, it's often I will work with anyone else who looks like high school kids or college kids. 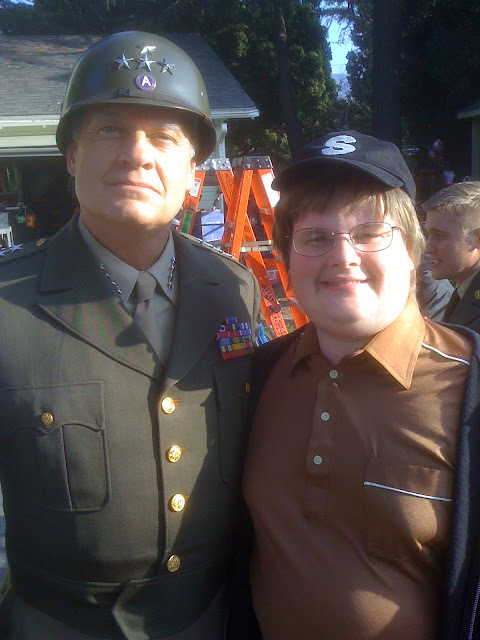 Also, when you are a regular on a show like "Chuck", you work with the same people every episode, which makes it fun to go to work because you build friendships and relationships with these people and network with the crew who you end up working with on other projects as well. Jesse with Mayim Bialik on "The Big Bang Theory"
What is the experience like for an extra on set? The experience on set for an extra is not always exciting; it can actually get boring if you get a lot of down time, but I am never really bored. If you are working on a sitcom like "Big Bang Theory" you get to sit in the stands and watch the main actors rehearse the other scenes of the episode, which can be a lot of fun. There will be food and drinks on any set at a craft service table and that can help hold you over until lunch or dinner. When it's time to rehearse your scene they call you down from the bleachers and tell you where to sit or stand on the set and give you direction of when to cross or make movements behind the main actors. Then you'll rehearse it a few times and then get ready to shoot for the audience. On movie sets and TV shows where there isn't an audience present, extras will often sit at tables in tents or in a separate soundstage designated for holding extras. Overall, your time will be on set working on scenes and coming back to the tents for lunch and then to wrap at the end of the day. I've usually had good experiences on sets but there have been a few where I felt the other extras and I were not being treated fairly. But sometimes you have to just put up with the conditions, because you're not there to relax in holding, you're there to work. What kinds of directions are given to the extras? Primarily, the 2nd Assistant Director will be the one dealing with the extras on sets. When you get on the set the 1st AD and Director will also give us direction. The directions vary from when we are to make crosses, where to sit in a classroom or auditorium, to which set of bleachers to sit in for a football game or sports scene. They'll also tell us when to actually cheer on the action or make noise and when to pantomime which is making words with your mouth but not actually talking. The key to good pantomiming is to say words like "watermelon" and "peanut butter", and seeing people talking that way without speaking makes it look like they are actually talking. Most often, you are to never look directly at the camera or at the actors talking because it's supposed to look as realistic as they can make it look, but there was one moment in Transformers 3 where Michael Bay directed me to look right toward the camera, and those type of requests are always special because you know you're in the movie. Can you tell me a time when you lost your composure during a take, especially during scenes with comedic actors? There have been times on set when you get frustrated and just tired. I remember my first day working as an extra. It was on the movie Rat Race and an all night shoot at a ranch north of Los Angeles in the middle of October. It was raining and cold and took forever for the night to pass; there were times I was ready to back out and go home but I kept at it and learned to enjoy my time on set, and before you knew it the sun was coming up and it felt good to know I survived my first night working in Hollywood. In Old School, the scene of the fraternity initiation where all the pledges were standing with cinder blocks on the ledge, I freaked out a little because I have a small fear of heights. I tried to strive through it but got too shaky for them to film me, so they let me go home. But I came back the next day and they were supportive of me and said that kind of thing happens to everyone. How has your cult fame changed your personal and professional life? My cult status has done amazing things for my life. I've attained many new friends and made great strides in my career, thanks to people seeing me on TV or in films. Every opportunity has opened the door for something else going forward in my career. Being in the Vonage commercials helped to land me the part in The Jerk Theory, and I've had other producers and directors tell me that I booked the part I came in for just because they recognized me from something and wanted to work with me and were eager to be on set with me themselves. My fan base has grown beyond cult I'd say because I have over three thousand Twitter followers and Facebook friends, and the Worlds Greatest Extra video on Youtube has almost reached three million views. I thank all of them for being fans. Are you being requested by name to appear in projects? I've been requested to appear in several projects, often by directors or writers who enjoyed working with me in the past. I mentioned Transformers 3; well, according to the casting people, I was personally requested for by Michael Bay for those scenes. Recently, I worked on a Samsung commercial with James Franco, who I worked with on Spiderman. Working with him on the ad led to him and his producer friend contacting me for a role in an indie film he was directing called As I Lay Dying, which we shot last September in Mississippi. Also, because of my recent success from the Youtube video, I've been requested for and done interviews with ABC News, NBC news, Time Magazine, Australian and German and British news stations, and got to be a guest on "The Tonight Show" with Jay Leno, fulfilling one of the many dreams I came to Hollywood with, and that was amazing. Did you find out how he/she discovered you and why he/she requested you? I can't quite explain it but I think the filmmakers requested me because they've seen my work or talked with their colleagues about my work. It's one thing to be talked about and sent requests from fans but it's such an amazing revelation and confidence builder to find out certain people, some of whom you've grown up watching their films and enjoying, are wanting you to be on their set and want to help my career. Jesse with Kelsey Grammer on set of "An American Carol"
How is your transition into acting roles coming along? My transition into acting roles has been very smooth, thanks to my tremendous team of agents and managers. Their belief in my ability to book roles has led to commercials, a print ad, music videos, TV show guest and costarring roles, and a couple films. I'm taking classes to perfect my skills and prep for pilot season, as my next goals are to book a part in a TV show or mini series, or something with a part I can work on for many years. In a previous interview, you mentioned other aspirations; do you still want to write or produce? Yes, I am still writing, and hope one day to share some funny and cool ideas with you all, whether I produce them myself or through the help of others. I'd share some of them with you if I could, but I don't want to float any ideas out there that have the danger of being stolen. What kinds of films do you want to get onto screen? I mostly want to create comedies, sci fi and dramas, and TV shows with all of that combined. I want to make a series people become die-hard fans of, like so many shows I have, like "Lost" and "24". What advice would you give to those who want to become an extra (or actor)? My advice to anyone who has a dream is to just follow them, because if you want it, you can have it. If you want to be an extra, just look up on Google or Yahoo "extra work" and your city, and it's a good chance you'll find a company seeking submissions. I wish you all good luck, and hope to see you on set or on screen soon. As his celebrity and acting career grows, things for Jesse Heiman are sure to change. In fact, most recently Jesse was featured in an ad for GoDaddy.com during SuperBowl 47 with model Bar Refaeli and racing star Danica Patrick. Whether it's his acting or producing ambitions, this is one extra that we can root for. TRIVIA: According to the director of the GoDaddy.com commercial, it took 65 takes to complete the kissing scene.